We have heard a lot about 'tough sanctions' on Russia following its invasion of Crimea, shoot down of an airliner full of Europeans, and the continued shadow war in Eastern Ukraine, yet apparently it's fine to sell him this 21k ton French-built amphibious assault ship. Bad move. Under a $1.7B contract between Russia and France, France would build the Russian Navy a pair of Mistral Class amphibious assault ships, after which Russia would build follow-on units under license in St. Petersburg. Russia has a least two additional ships planned. Part of the Mistral Class deal provides Russia with a quartet of economical but modern amphibious helicopter carriers, the other part jump-starts Russia's latent large shipbuilding knowledge and industrial base which has significantly atrophied since the Soviet days. In other words, the Mistral Class deal's one-two punch is both as a new means of power projection for Russia and as a technological and industrial infusion that would allow Putin's more belligerent Russia to jump 10-15 years ahead of their current big warship building know-how. Not a bad deal for $1.7B. It has been said that France's Mistral Class, of which three serve in the 'Marine Nationale,' offers close to the same capability of the US Wasp Class Amphibious Helicopter Docks but at one sixth the cost and crew size, and the type has been lauded for packing a tremendous amount of flexibility into a relatively streamlined and efficient package. France classifies the Mistral Class as a 'projection and command ship,' but really it's a 653-foot multirole capitol ship with a 69,000 square foot flight deck, large hangar deck, floodable well deck, storage for sixty vehicles, quarters for 450 soldiers (up to 900 for surge operations), large medical facilities with 69 beds, and extensive command and control capabilities. In her hangar and on her flight deck she can deploy up to 35 helicopters, ranging in size from small attack helicopters to 'super medium sized' choppers. Even heavy mine clearing helicopters such as the American MH-53 Sea Dragon or the MV-22 Osprey can use a reinforced landing spot, which is one out of six total spots available. In addition, she can deploy four beach landing barges or two LCACs from her stern. Possibly the most remarkable thing about the Mistral Class is that she can do all this with a standing crew of just 160 sailors and 20 officers. Automation and simplicity of maintenance were driving factors for the Mistral Class design from its inception, and in operation, these design goals result in low operating costs, which is a huge selling point for cash-strapped Navies looking for big power projection capabilities. Although Russia is the only Mistral Class export customer as of yet, there are many other nations seriously looking at purchasing the design, including Canada, Malaysia, South Africa, Sweden and possibly Turkey, amongst others. The Mistral class is said to be France's first all-electric warship, and is powered by a three generators that crank out close to 21MW of power. The ship is propelled by a pair of state of the art Rolls Royce 'Mermaid' azimuth thrusters, each pushing a five bladed propeller. This gives the carrier a top speed of around 20 knots. The Mistral's 9,000 square foot command center can accommodate up to 150 mission specialists and command staff, but it is not clear as to what French components and what Russian components Russia's Mistral Class ships will receive. Currently, France's Mistral Class ships are outfitted with a state of the art command, control and communications system that works with onboard and off-board sensors, many of which are NATO compatible, such as Link16/MIDS data link system. Additionally, France utilizes its SYRACUSE satellite communications system, and the Mistral's communications architecture is partially built around this system, so Russia would presumably outfit its ships with its own proprietary satellite communications system. 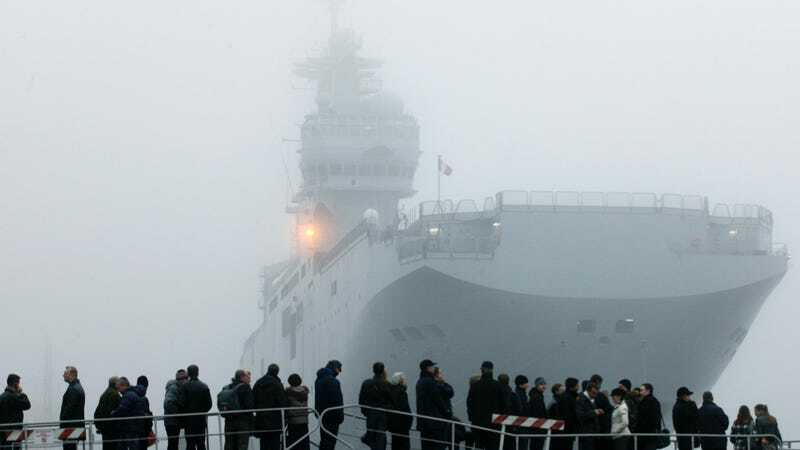 Just how much state of the art French military tech Russia would receive was a major sticking point in negotiation for the ships as Russia wanted all of Mistral's advanced electronics, including its radar and communications systems. Some sort of compromise was reached, but fears persist over just how much sensitive technology transfer is included in the deal. A Russian combat management system will be installed on board in France. The communication system will integrate Russian communication equipment with French equipment. Some of these equipment will be installed and integrated with the French equipment, some Russian equipment will be installed in Russia. The radar is French. ESM(Electronic Support Measures, detects & pinpoints incoming radar emissions) is not planned on board. Only the pre-installation of the self-defence (A360, Gibkha) will be done in France. The installation will be done in Russia, after the delivery of the ship. Additionally, AK-630 close in weapon systems, as well as SA-N-10 'Igla' short-range point defense missile systems, all of Russian origin, will be scattered around the ship. The Vladivostok Class, as it is called in Russia, will have a primary armament of potent KA-52K 'Alligator' attack helicopters, KA-29 assault choppers, as well as possibly a couple KA-27s for search and rescue and logistical duties. This complement can change depending on the mission as well, with more attack helicopters being surged for strike operations and submarine hunting or assault helicopters being embarked when applicable. Still, the outright acknowledgment that expensive and highly capable KA-52s are being procured for the Mistral Class ships sailing under the Russian Naval flag is telling as to their intended purpose. There is no question that the Mistral Class is a powerful yet efficient design, which has many wondering why France is proceeding with selling it to Russia in light of the their recent 'extra-territorial' aggressiveness. The answer is simple: money. Many in NATO and the EU saw the Russian-French Mistral Class deal as questionable to begin with, as it would transfer technology to Russia, as well as infuse new design and warship building concepts into Russia's stagnating ship building industry. But that was four years ago. Since the invasion of Crimea, this questioning of the Russian-French Mistral deal has turned into outright protest as having a NATO member arming a potential future foe with such a powerful amphibious capability, and teaching them how to build modern large warships in the process, seems at the very least counterproductive, if not downright dangerous. Early on in Russia's push into Crimea, France threatened to cancel the Mistral Class contract with Russia, but once the Crimean Peninsula was secure, they stated the sale would go through as planned. Yet providing Russia with a new and powerful capability so that they can just threaten countries along the Black Sea, and possibly the Baltic Sea, should not be worth $1.7B and about 3,000 temporary jobs for France's sputtering shipbuilding industry. One would think that the sanction packages that the west imposed on Russia following the Crimea invasion would have stopped the procurement of these ships, but this was not the case. The first two tiers of economic sanctions apparently had language regarding the Mistral Class removed, with only the yet to be enacted third tier of sanctions including the withholding of delivery of these powerful ships. Meanwhile, some in Washington have demanded that NATO buy the ships and use them to beef up the alliance's weakening power-projection capabilities. Yet this initiative was met with little support from the White House, but a second initiative originating from German Navy has proposed that the European Union purchase the ships and operate them cooperatively. With last week's news that Russia has clearly invaded parts of Ukraine proper, and recent comments regarding Russia's massive nuclear stockpile made by President Vladimir Putin, should put the EU and NATO on notice as to just how stupid selling these ships to Russia is. In addition, Russia has now come out a said that they will not pay for their end of the contract until both ships, the Vladivostok and the Sevastopol, are delivered and their crews are trained. Today, the EU has laid down an ultimatum to Russia regarding their direct incursion into Ukraine — either Russia pull back or much tougher sanctions will be enacted. Taking Russia's recent history into account, the chances Putin will back down are slim. We will just have to wait and see if this sale will continue under such adverse circumstances, but general logic states that is not worth selling a high-powered rifle to the guy that has already robbed your neighbors at gunpoint. Photos via AP and Public Domain.